A Towny MCMMO survival server. We are a server by users for users. Most of us come from servers we poured our heart and soul into only to see it closed down. Kaizen Worlds intends to be free of that, as such I do my very best to keep expenses low so we can run the server off donations. When we all share the cost we can play for next to nothing. If you enjoy the server please consider donating, every dollar helps and will be invested 100% into the server. So far the top donators are SFaulken, MattTheDolphin from the G2 Project, Samantha, The_Troy and the Grolleman father and son team! 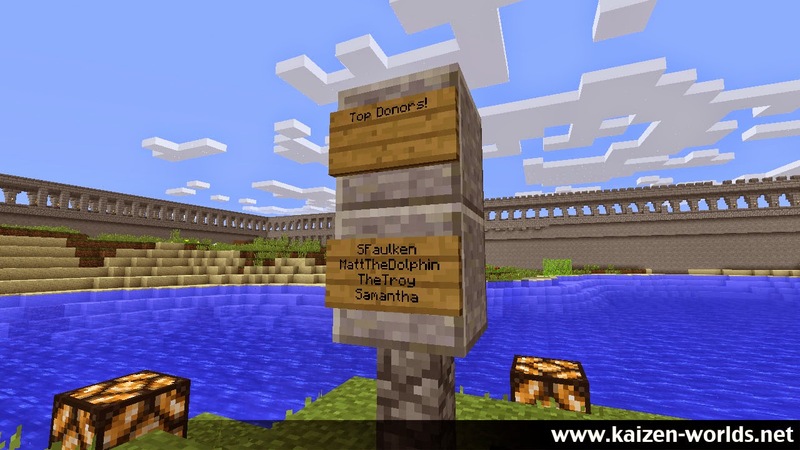 If you are unable to donate please invest some time in promoting the server. Tell your friends and family, share one of the blog posts or screenshots on other social media such as Facebook, Instagram, Tumblr, Google Plus or whatever network you are on. The more people the more fun! Previous Post: What is Yeti doing to the water temple he found? This server is hosted at ServerMiner, check them out today! Copyright © 2019 Kaizen Worlds. Powered by WordPress and Stargazer.